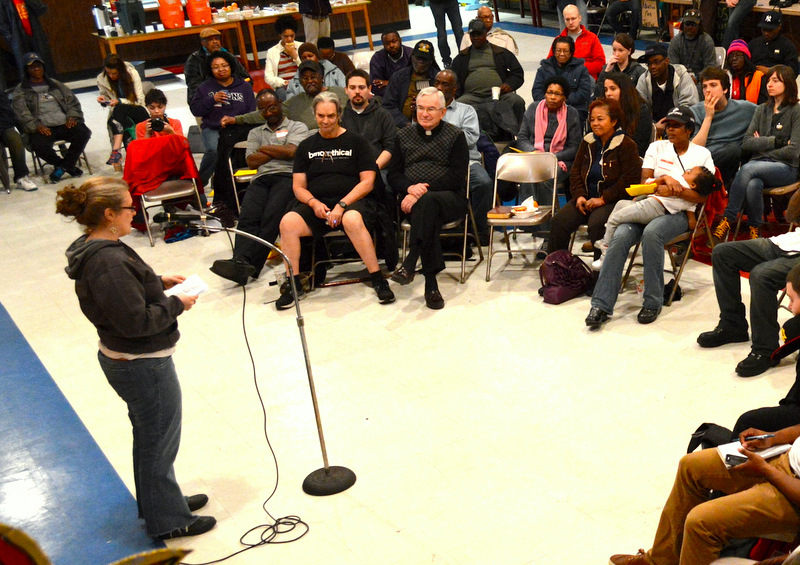 Above: Beth Myers-Edwards describes her experiences as a renter in McElderry Park at a Speak Out yesterday. More than 60 people gathered yesterday at St. Wenceslaus Hall, near the Johns Hopkins-propelled redevelopment of East Baltimore, to relate their experiences with abandoned and overpriced houses. The “Speak Out” was sponsored by United Workers and other activist groups seeking to change the city’s housing priorities, which they say skews development to subsidized waterfront properties and neglects affordable housing for lower-income residents. Among the topics discussed was the plague of vacant houses across the city and in particular the abandoned or demolished properties north and east of the Hopkins Medical complex that has accompanied the East Baltimore Development Inc. (EBDI) project. “People are living in houses that are not adequate. 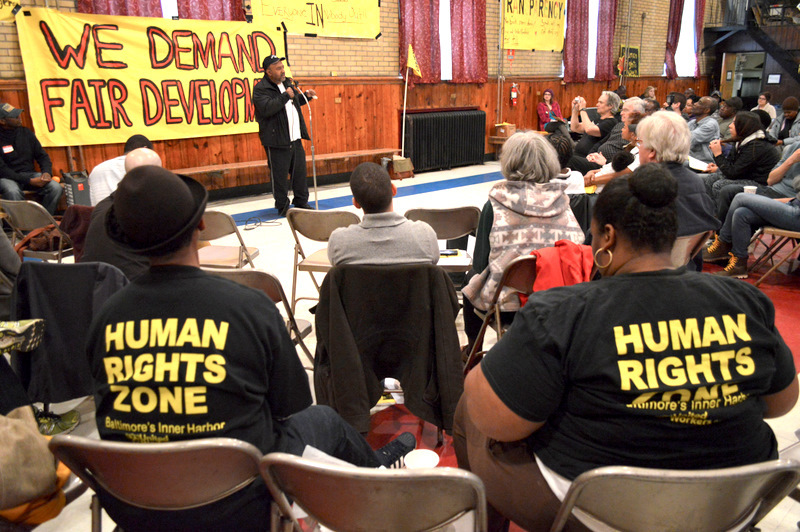 People want to be involved in a process around community and neighborhood development, and they’re not having that opportunity,” said Michael Fox, an organizer for United Workers. He cited Harbor Point – and its $107 million in TIF tax incentives – as an example of the city’s favoritism to well-connected developers. “Our system of housing is broken,” added Shantress Wise, who said she was pushed out of her rental home in 2009 as a result of a city-subsidized private housing project. Eventually, Wise said, said she became homeless when she lost her job following a medical operation. “We need to hold the developers accountable, not to come into our communities and take away our housing and push us out of our homes,” she said to loud applause. Relating her experience of living near Hopkins, 29-year-old Beth Myers-Edwards said, “I used to live next to a row of vacant homes that altered the quality of day-to-day life. Now those homes are developed as market-rate properties and people call it progress. Fox said the lack of “fair development” has increased homelessness in the city and led to quality-of-life issues where residents must cope with dangerous and sometime crime-plagued vacant houses. The group is studying several ideas, such as community land trusts and shared-equity housing, in which residents have a direct role in deciding the priorities for neighborhood development.